Oryza sativa, commonly known as Asian rice, is the plant species most commonly referred to in English as rice. Oryza sativa is a grass with a genome consisting of 430Mb across 12 chromosomes. It is renowned for being easy to genetically modify, and is a model organism for cereal biology. 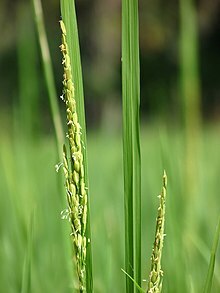 Oryza sativa contains two major subspecies: the sticky, short-grained japonica or sinica variety, and the nonsticky, long-grained indica rice [ja] variety. Japonica varieties are usually cultivated in dry fields, in temperate East Asia, upland areas of Southeast Asia, and high elevations in South Asia, while indica varieties are mainly lowland rices, grown mostly submerged, throughout tropical Asia. Rice occurs in a variety of colors, including white, brown, black, purple, and red rices. Black rice (also known as purple rice) is a range of rice types, some of which are glutinous rice. Varieties include Indonesian black rice and Thai jasmine black rice. A third subspecies, which is broad-grained and thrives under tropical conditions, was identified based on morphology and initially called javanica, but is now known as tropical japonica. Examples of this variety include the medium-grain 'Tinawon' and 'Unoy' cultivars, which are grown in the high-elevation rice terraces of the Cordillera Mountains of northern Luzon, Philippines. Glaszmann (1987) used isozymes to sort O. sativa into six groups: japonica, aromatic, indica, aus, rayada, and ashina. Garris et al. (2004) used simple sequence repeats to sort O. sativa into five groups: temperate japonica, tropical japonica and aromatic comprise the japonica varieties, while indica and aus comprise the indica varieties. Rice has been cultivated since ancient times and oryza is a classical Latin word for rice. Sativa means "cultivated". ^ CECAP, PhilRice and IIRR. 2000. "Highland Rice Production in the Philippine Cordillera." ^ Glaszmann, J. C. (May 1987). "Isozymes and classification of Asian rice varieties". Theoretical and Applied Genetics. 74 (1): 21–30. doi:10.1007/BF00290078. PMID 24241451. ^ Garris; Tai, TH; Coburn, J; Kresovich, S; McCouch, S; et al. (2004). "Genetic structure and diversity in Oryza sativa L." Genetics. 169 (3): 1631–8. doi:10.1534/genetics.104.035642. PMC 1449546. PMID 15654106. Wikimedia Commons has media related to Oryza sativa. This page was last edited on 24 March 2019, at 10:02 (UTC).